Congratulations, your registration for Salt Lake Board of Realtors® is complete. 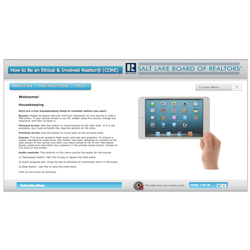 You are now logged into Salt Lake Board of Realtors®. A portion of the proceeds of this CE course will be invested in RPAC (the Realtor® Political Action Committee) in your name. 100% of the proceeds go to Realtor® friendly candidates running for political office. If you would not like to make such an investment, but would still like to take the course, please contact SLBR Staff at 801-542-8840. Do you need to get your Code of Ethics requirement done for your local Realtor® Board or Association? Take this course and receive 3 Hours of Utah CORE CE, as well as fulfil your Code of Ethics requirement. Join Peter Christensen, former head legal counsel for the Utah Association of Realtors, as he walks you through the important highlights of the Realtor® Code of Ethics. These 3 hours will fly by. Why not kill two birds with one stone? This course is brought to you by the Salt Lake Board of Realtors®, the largest local Realtor® Association in the State of Utah, providing CE to Realtors for almost 100 years.